Pace Sportswear has teamed up with Italian Pad Manufacturer La Fonte to create shorts that are the best of both worlds. US design and construction fused with Italian technology and craftsmanship equate to an amazing product. La Fonte has spent years creating and testing hundreds of products with world class cyclists. The pads we have chosen use the latest technologies in materials and assembly. A 'thermic moulding' procedure is used where time and temperature calculations are based on the fabric, thickness, foam density, and fabric treatments. The density measurement equals the weight needed to push the chamois in a point and reduce it to a level of zero. 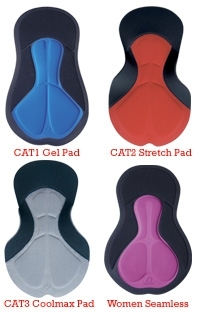 All Sanitized Pads are built with a permanent anti-bacterial treated fabric; this allows the pad to stay fresh and not lose its properties after washing. Hollow Tech is a hollow central channel designed to relieve pressure for the perineum nerve. Bi-Elastic for 4 way stretch, Hollow Tech, Sanitized, Seamless construction, and Anti-Shock GEL. Bi-Elastic for 4 way stretch, Hollow Tech, and Sanitized. Bi-Elastic for 4 way stretch, Seamless construction, and Sanitized.